Polvo Art Studio is an alternative space located in Chicago's Pilsen neighborhood and is operated by Polvo (an artist collective originally formed in 1996). Polvo's history consists of organizing artistic and cultural venues with Pilsen/Chicago-based community spaces. In addition to venues, Polvo generated a magazine focused on arts and culture followed by an online website that initiated an international array of visual artists, writers, and cultural critics (Polvo maintained a Pilsen gallery space in 1999). Since February 2003, Polvo has been organizing and curating art exhibits at the Polvo Art Studio space where we showcase contemporary art including installation projects, new media and performance by a diverse group of emerging and established artists. 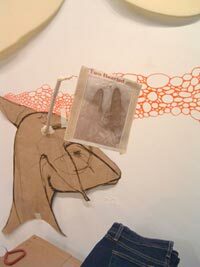 For the Stray Show 2004 we will show new work/installations by 5 of the members: CarianaCarianne, Edra Soto-Fernandez, Miguel Cortez, Dianna Frid, and Saul Aguirre. "Sky Sifters #1 and #2 (details)"